Cmdr. 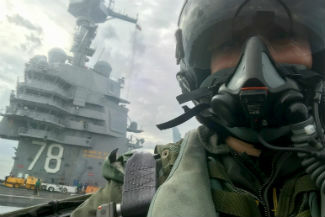 Stacy Uttecht, a 2000 graduate of the Virginia Tech Corps of Cadets, waits on the deck of the USS Gerald R. Ford during a flight deck test in November 2017. The Ford is the Navy’s newest carrier, commissioned in July 2017, and Uttech flew the first fleet aircraft to land aboard the carrier. During her military career, U.S. Navy Cmdr. Stacy Uttecht has done everything from flying with a F/A-18 Super Hornet demonstration team to commanding a fighter squadron. On Saturday, the 2000 graduate of the Virginia Tech Corps of Cadets will add a new accomplishment to that list as she leads a team of F/A-18F Super Hornets over Lane Stadium at the start of the homecoming football game. “It will be an honor to represent my service and to show Naval air power at my alma mater,” said Uttecht, who earned a degree in business management from the Pamplin College of Business. She is the commander of Strike Fighter Squadron 32, the “Fighting Swordsmen,” at Naval Air Station Oceana in Virginia Beach, Virginia. The F/A-18 Super Hornet is the Navy’s primary strike aircraft. The twin-engine, supersonic, all-weather fighter jet is capable of landing and taking off from an aircraft carrier. It has a top speed of 1,190 mph and a range of more than 2,000 miles. The other aircrew will be: Lt. Cmdr. Elliott Shoup, who graduated from Virginia Tech in 2002 with a degree in aerospace engineering; Lt. Cmdr. Sean Reed, who earned a degree in political science in 2006; Lt. Alex Mickle, who earned a degree in mechanical engineering in 2013; as well as Lt. Cmdr. Kevin Swift and Lt. Ryan Furtner. The flyover is jointly sponsored by the corps and the Athletics Department. It is subject to change based on weather and operational barriers. An F/A-18F Super Hornet flies over the Arabian Gulf after taking off from the USS Eisenhower in 2016. Photo courtesy of Strike Fighter Squadron 32. Since 2002, she has logged over 3,500 flight hours and more than 300 carrier landings. Uttecht started as an F-14 Tomcat radar intercept officer based at Oceana, and her first operational tour was with Fighter Squadron 103, where she deployed on the final voyage of USS John F. Kennedy in support of Operation Iraqi Freedom. After that, the Navy retired the F-14. Uttecht began training in the F/A-18F Super Hornet. She remained at Oceana, where she served as an F/A-18 flight instructor and was selected as a member of the 2007 Super Hornet Demonstration Team, performing in 13 air shows across the country. Other assignments included a tour with an Air Force special operations squadron, where she flew 160 combat sorties in Afghanistan; an operational department head tour with Strike Fighter Squadron 11, where she deployed on the final cruise of USS Enterprise in support of Operation Enduring Freedom; and the readiness officer for the commander of Naval Air Force, U.S. Pacific Fleet, where she managed readiness for all West Coast F/A-18 squadrons and one F-35C unit. In August 2016, she returned to Oceana as the executive officer of the Fighting Swordsmen, deploying with the USS Dwight D. Eisenhower in support of Operation Inherent Resolve. When she took command of the Swordsmen in January, she became the second female aviator to ever command an F/A-18 squadron.